Find hotel near Church Of The Holy Trinit ..
First erected in 1600, taking its final form in 1716, this is the second oldest church in city. Its look and design is inspired by the Cathedral of Cartagena. Check out the Mujedar style coffered ceilings and the painting of Purgatory on the altarpiece which has an image of st. Michael. The interior is otherwise sombre and austere. This is in stark contrast to the plaza outside the church (which shares the same name). There, every evening, you’ll find a very lively neighbourhood. Buskers and dancers perform, street vendors sell their wares, and locals and tourists alike mill about. There is some striking street art painted on the walls of the nearby buildings. It’s a great place to people watch. Timings given here were taken from a secondary source and may not be accurate. Check with the church before your visit. Bella capilla ubicada en el popular barrio de Getsemaní, está muy bien decorado el altar. La misa es muy tranquila y familiar, se llena todos los domingos por la gente del barrio y turistas visitantes. Es agradable el lugar. Lugar histórico y religioso, muy cuidada, sitio obligado para visitar y orar. 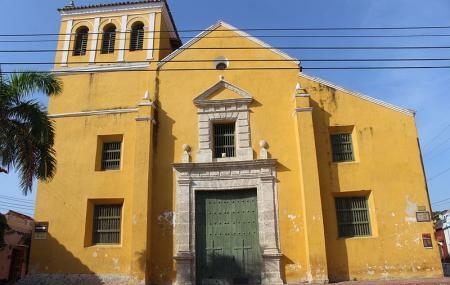 Iglesia ubicada en getsemani, un barrio muy turistico al lado de la ciudad amurralada, esta rodeado de restaurantes.